Home / Trending / Insta-Favourites / Step 3 – Peptide Daily Moisturiser & Eye Cream. Millionaire Peptide Pro Daily Moisturiser and Eye Cream, also known as ‘Step 3’ in our Millionaire Peptide Pro range is an organic, lightweight cream based moisturiser which works to penetrate all three layers of the skin, whilst hydrating and plumping the skin throughout the day – leaving the skin soft, smooth, plump and firm. ‘Step 3’ in our Millionaire Peptide Pro range is very creamy and can also be applied under the eyes to smooth away fine lines, reduce puffiness and brighten to reduce the appearance of dark circles. 100ml. I’ve got dry skin and so I loved this – it’s so rich and creamy! For someone who doesn’t have very dry skin, a little will go a long long way. Normal / dry skin types will enjoy using this. Combination skin types can benefit from using this on dry patches. The good thing is it can be used as an eye cream, so even if not using all over the face you will still have a daily use for it when using it under the eyes, and in terms of eye creams it is excellent value for money. I would avoid oily areas of your face such as the T-zone and stick to using the serum (step 2) on those areas for a lighter moisture boost. Oily skin types may prefer using the Vit C Skin Glow City Defence Moisturiser in place of this, as their step 3 in a skin regime. Try to understand if your skin is dry, or if it is dry and dehydrated as well. When Jas first gave me a proto-type for this cream I liked it, but I fedback to her I felt it wasn’t complete. It was rich and creamy and did 80% of the work, but my skin still felt thirsty. So she developed the Serum (step 2) and the game changed. Using them together resolved my dryness and dehydration. Now, I can’t have one without the other for my skin type – they’re like my yin and yang! Aloe Vera Leaf Juice (Aloe Barbadensis): A pure healing ingredient – it provides anti-inflammatory properties that reduce skin inflammation. ​Ppseudo Collagen: Upon ageing, the collagen and elastin content in connective tissue reduces with an accompanying decrease in ability to retain moisture. The skin becomes thinner, takes on an aged appearance and often develops wrinkles. Pseudo collagen mimics the action of collagen. Our Pseudo Collagen is not sourced from animals or GM 8543 crops, making it suitable for vegans. ​Peptamide 6 Plus (Hexapeptide-11): A repairing ingredient – it firms the skin, reduces the appearance of fine lines, repairs DNA, increases cellular oxygen consumption and helps collagen production. CO-Enzyme Q10: Energizes your skin helping it to repair damage and ensure skin cells are healthy. It protects against photo-ageing (premature aging due to over exposing the skin to the sun). Vitamin A: Encourages healthy skin cell production. Retinal, retinol and retinoic acid are important to cell production and growth. Vitamin A also stimulates fibroblasts – the cells responsible for developing tissue that keeps skin firm and healthy – in the deep layers of your skin. Helps to keep skin fresh and cell turnover to its optimum. AHA Fruit Acid: Perfect for treating skin that is wrinkled and aged by sunlight. 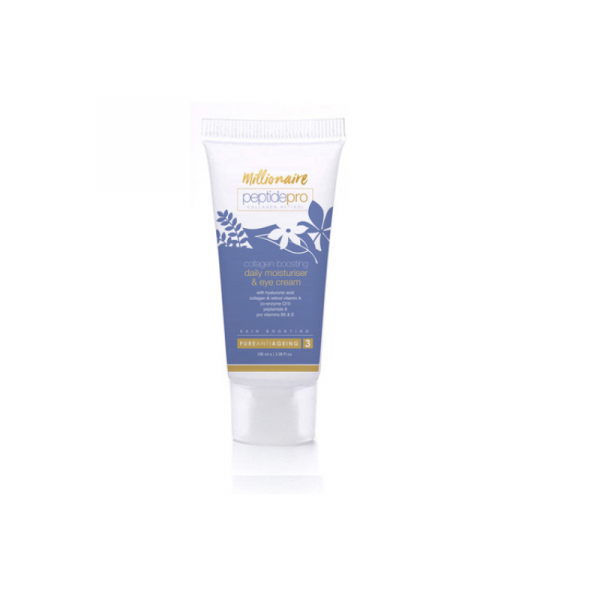 Promotes skin radiance and helps to gently exfoliate dead skin cells to promote renewed cell growth. Hyaluronic Acid: Being able to hold 1,000 times its own weight in water, Hyaluronic acid is the number one ingredient when it comes to anti ageing, with it being able to plump the skin, leaving it look and feeling super soft and healthy. Vitamin E: Vitamin E oil works to block free radicals from the body, which play a large part in the aging process. If we can fight off free radicals, then we can reduce wrinkles and keep the skin youthful-looking. Take a small amount of Millionaire Peptide Pro Daily Moisturiser and Eye Cream gently massage into cleansed skin on face and neck using circular motions to promote healthy, glowing and younger looking skin. I recommend using ‘Step 3’ in our Millionaire Peptide Pro range in the morning and evening after Millionaire Peptide Pro Exfoliating Liquid Gel Hydrating Skin Serum. In case you didn’t know…. 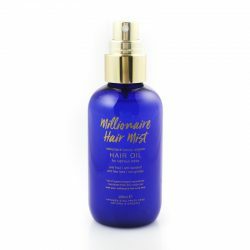 Millionaire Beauty Skincare and Haircare range is made up of a blend of supercharged organic and natural ingredients which work as the ultimate pick-me-up suitable for all skin types and hair types. For each Millionaire Beauty Skincare and Haircare product, the regimes are thoroughly thought out and each ingredient is carefully added at the correct amount to ensure they work together to target skincare concerns (including dry skin, oily skin, combination skin, pigmentation, scars and acne) and haircare concerns (including dry hair, frizzy hair, hair loss, thin hair and damaged hair).